The kids and I took a walk to my parent's house just ten days ago, and I snapped this picture. So much can change in ten days. Just with our weather as one example, change is constant. That lovely weather was followed by freezing rain and icy roads. And now, the lovely blooms that covered the camellias and azaleas around the farm are brown, but our weather is once again perfect. We've had our windows open for three days! I am so thankful that my God is unchanging! Adding an Amen! to that. Ours are gone now, too, but before the hail and tornado last night my daughter pointed out the first hint of blooms to be on our Japanese magnolia. I hope they survive and bloom. Yes!! The weather has been springlike for us as well. It brought such delight to us all to be able to go out and about for a few days with ease. So grateful our God does not change but is always One we can know and depend on. Blessings! So am I! Blessings to you, too. 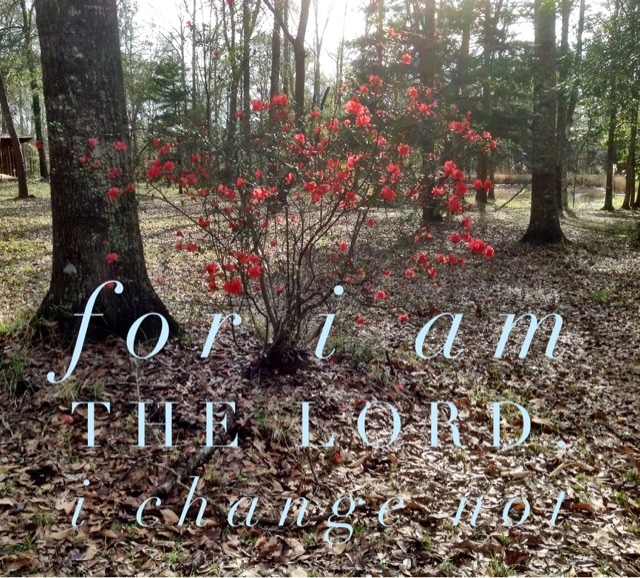 "I change not" - such an incredible promise! This is my first time here. Thank you for hosting! How wonderful that God does not and will not change, no matter how much the weather and our surroundings can change in just a short time!